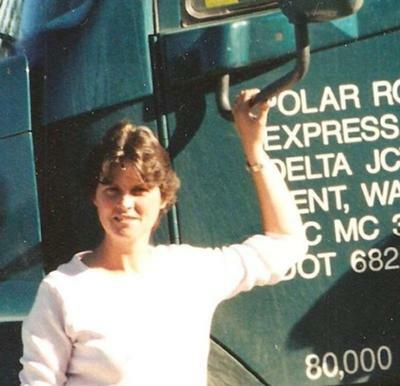 I started trucking in 1999 due to the fact I was living in Alaska and I didnt care to be left at home while my husband went out on the road for 2 and 3 weeks at a time and left me at home in -60 degree temperatures in the interior of Alaska. So one time when my husband came home I had nearly burnt the house down and told my husband that I didnt like being here alone. With that statement he enrolled me in Truck driving school so I could drive with him. I loved that so I started my courses and passed my driving test and have been driving off and on every since. This experience gave me a different way to look at life on the road. Every bend in the road and every minute on the road is a living post card. I have boxes and boxes of pictures I took while driving. I even hooked up the video camera on a tripod and video tape some of our driving on ice pack roads. I unfortunately have the recollection of our only wreck on the highway. We were driving in a 3 truck convoy on the Cassier Highway in Canada. My husband was a seasoned drive with some 4 million miles under his belt so there was never a concern on my behalf to be afraid to sleep behind his driving. All this changed as a result of this wreck. After this turning over of our truck, I found it very hard to sleep for some 6 months after that. I realized then that there was was really no safe side of a bunk in the sleeper of a tractor when you are in the middle of a wreck. I woke up to his voice saying," I dont know where we are going Bob, but we are going over." and all of the sudden I heard the aftermath of leaving the road and miraculously landing gently on our wheels. God was with us that day. If you had seen where we landed you would believe that was true. My life as a (woman)trucker is a story that cant be told in five minutes. My life has been impacted by that choice I made to go to school and learn the correct way to drive. One instructor told me something that I learned to be very true. You go to school to learn how to drive by the book but you will really learn how to drive when you are out there on the road actually driving. Driving out on the road does give you a lot of power. You can gain the respect you deserve by how you perform out there. Respect out there isnt something you can demand just by asking for it. It is something you earn. Like life, driving is full of choices. Choices you will make that will determine what type of driver you are going to be. I will close with this.....If you want to drive a big truck and you are a woman, dont let anything stand in your way, including yourself and be wise in the choices you make and you wont have to tell anyone that you are a good driver, they will already know it. Reputation will speak for you. Loved your post on Alaskan trucking wish you would post more stories and pictures on your adventures in trucking in Alaska LOL. Would love to hear more. I love this page!!! People really don't understand how hard it is to find a truck driving job. So many people have certifications and no job. Fortunately, for me I was able to go to a truck driving jobs site that helped me a lot.They were able to place me quickly and effeciently. By the way,I love his page! Its a good way for all truck drivers to connect and help one another. Great page!! !